This is both an abitmoreveg recipe and an update of an old twimii recipe. It’s a milky mash of potato, courgette and onion topped with crisped dillisk. It’s a big bowl of comfort. And yes the seaweed does really add to the taste – search it out, it’s worth it. 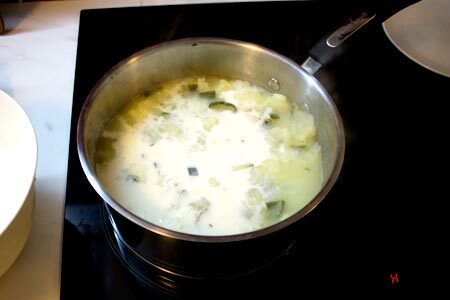 An abitmoreveg autumn recipe for a soup that’s really a very milky mash of potato, courgette and onion. I top it with Dillisk when I have it. 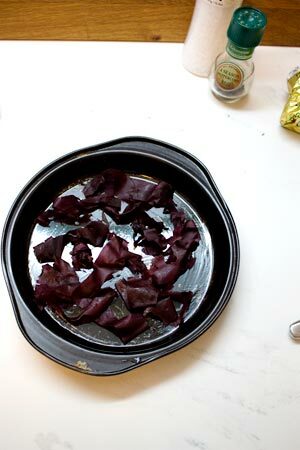 Dillisk (or Dulse) is a dark red seaweed that is very rich in iron and also contains vitamin B12. It’s so good for you, particularly if you’re vegetarian – and it really adds to the soup. Also, if you try it and like it add in more seaweed because it’s so salty and tasty with this soup. And the end result is a very comforting soup that is packed with nutrients. This soup is very easy to make and so comforting. It’s really nursery food that adults can enjoy too; a milky mash of potato, courgette and onion, with some rosemary, thyme, salt and pepper. I’ve actually been making this soup for years but didn’t think of adding it here before because so many people make their own version of this. Then recently there seemed to be a lot of talk in the media about people eating less potatoes (that’s the kind of story that gets attention in this country). Apparently people are eating less potatoes than they used to and this is being attributed to people wrongly believing that potatoes aren’t good for you. I love potatoes, always have and presumably always will but I myself found that in the last 10 years or so I was eating less potatoes than I used to. This is not because I don’t know how good potatoes are nutrition-wise, this is because cooking pasta or rice is that tiny bit quicker because you don’t have to peel them or anything. I suspect this is the reason most people have stopped having them with every main meal – people generally take the easiest option even if it may not be the best one. Since going gluten-free pasta is off the menu (and I love pasta too!) so I have started eating more potatoes again. I like rice but I do like a bit of variation and while quinoa is a very good option it’s not quite as comforting on a chilly autumn or winter evening as say a lovely baked potato, or a beautiful bowl of creamy mash. But enough about the potatoes, there are also courgettes and onions in this. Courgettes are full of soluble fibre, among other things, and onions are also very good for you apparently (but best when raw or lightly cooked, which is not the case here). It is also very rich in milk and butter. Dairy is something that I have to consume in moderation. I think dairy suits some people very well and they benefit a lot from including it in their diet, some people it doesn’t agree with at all and should avoid it completely, and some people like me can eat some of it and do (because I love lots of dairy products) but eating a lot will give you trouble – like for instance sinus trouble. I think it’s very important to listen to body and go with whatever it’s telling you. For both sides of the “is dairy good for you?” debate I found this helpful little article. Personally, I think it’s a case of one size does not fit all and even if it isn’t one of your superfoods, it still is a part of many wonderful dishes I love. Like this simple little one. 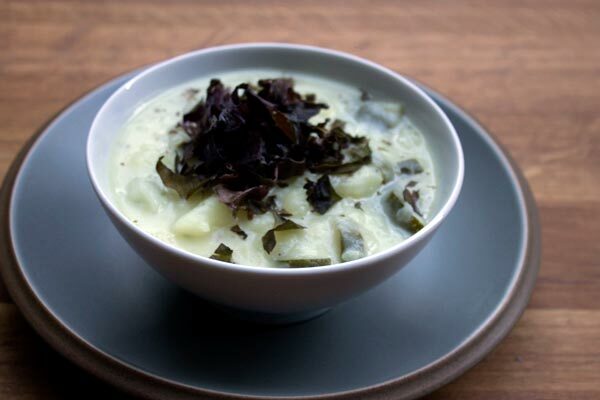 I know not everyone is a fan of seaweed but you really should try dillisk with mashed potato they go together really well and dillisk is packed with iron, zinc and potassium (and vitamin B12 which makes it especially good for vegetarians) making it a great addition to any winter dish. 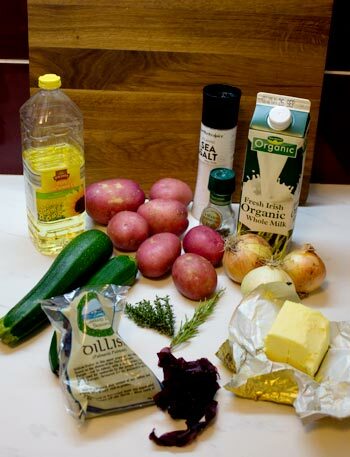 Potatoes, courgettes, onions, thyme, rosemary, butter, milk, salt, pepper, some oil and dillisk. Heat a little oil on a gentle heat in a suitable large pan. Add a pat of butter and let this melt into the oil. 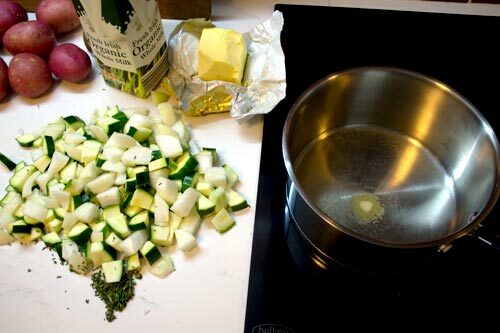 Add the courgettes, onions and herbs, mix around well. If you are not using the dillisk, add a little salt and pepper and stir in well. If using the dillisk wait until you have mixed it in (at the end when served) and then adjust seasoning as you see fit. This is because the earlier you add salt generally the less you need to add at the end but you might find, depending on how much dillisk you add, that you don't need any seasoning at all. Cover the pan and leave to sweat until the onions are starting to turn translucent (about 5 - 10 minutes). Add the potatoes and just enough water to cover them. Turn the heat up to high and bring to the boil. Once it is boiling, cover and reduce the heat. 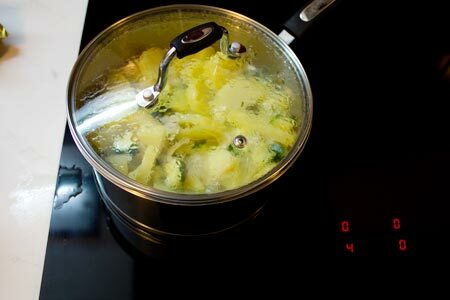 Leave to simmer until the potato slices are soft enough that a fork will pass through them easily, with little or no resistance. If using the dillisk, having rinsed it thoroughly, break it up and place on a lightly greased baking tin. Grill for about one minute or until it has got crispy. Take out from under the grill. Allow to cool for a minute or two and then crumble it over your bowl of soup. Heat a little oil on a gentle heat and add a pat of butter. 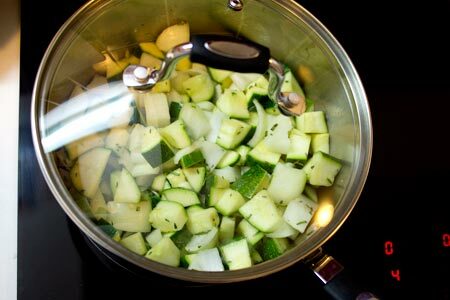 Add the courgette,onion and herbs to pot and sweat for 5 – 10 minutes. 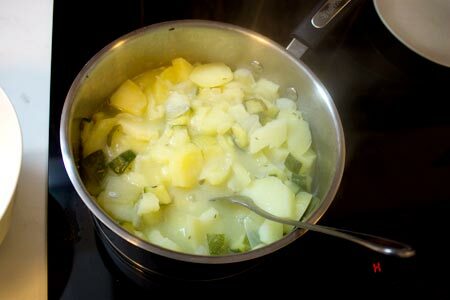 Add the potatoes to the pot with just enough water to barely cover them. 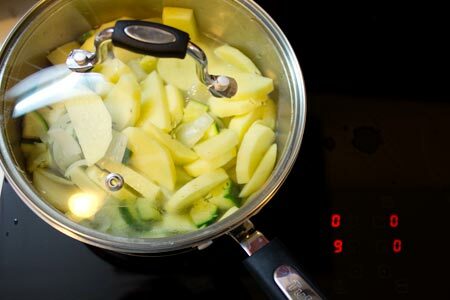 Once it’s come to a boil, reduce the heat, cover the pan and simmer for 10 – 15 minutes until you can easily pass a fork through the potato slices. Once you can pass a fork through the potato slices and get little to no resistance, turn off the heat. Add in another pat of butter and add a good glassful of whole milk. Mix and mash in gently with a fork. If you want it totally smooth you could use a blender but this actually tastes more comforting when it’s a bit lumpy. Rinse the dillisk well to ensure that its free from any sea-shore stuff. Place on a lightly greased plan and grill until crispy. Takes less than a minute – don’t take your eye off it. 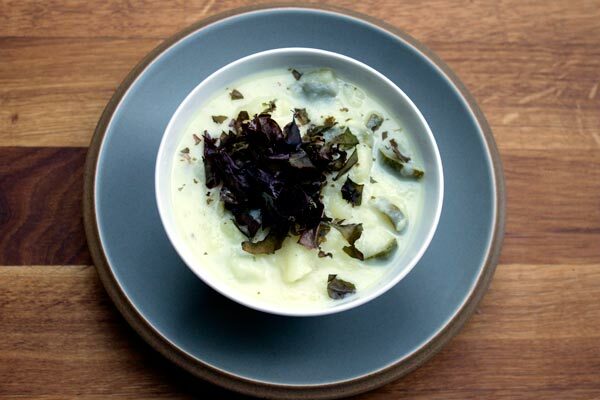 So tasty, so comforting and so full of goodness – dairy-rich potato, courgette and onion soup topped with crispy dillisk.